One high-ranking Artist across all genres will gain (4) hours of free studio time at Sanctum Sound Studio in Boston or LA. The time includes studio space, engineer, any studio mics or gear and a CD or DVD of the session. 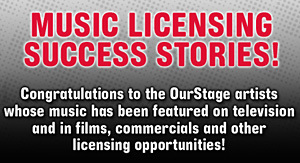 One high ranking artist across all Channels will be selected in conjunction with the studio and the OurStage editorial team. The prize must be claimed within 60 days of notice and must be used in full in one session.